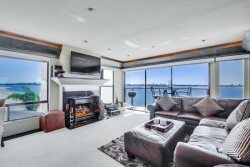 Stunning 3 bed/3 bath with ocean views from every room, just across the street from Mission Beach and Bay! Below you will find details about our home, Pacific Blue #202, located in Mission Beach. *NOTE: This home is located by the beach but this condo is still a NOISE SENSITIVE property. Respect must be shown to the property and neighbors at all times. No loud music, parties, and or loud talking outside after 10 pm. Violation of these rules MAY result in immediate eviction from the property per your rental agreement, and/or charges from the San Diego Police. Pacific Blue #202 is located in a 3-floor, 18 unit building with an elevator, just across from Mission Beach and Mission Bay. Enjoy incredible ocean views from every room of this 3 bedroom, 3 bathroom condo. Modern furnishings include new stainless steel kitchen appliances to include a dishwasher, a dining table that seats 6, spacious kitchen and living room, central A/C and televisions and ceiling fans in every bedroom! This stunning condo has all the amenities you could need for a fun and comfortable stay including 2 assigned parking spaces in the underground, gated garage, washer and dryer in unit and 3 separate baths with shower and tub combos. The balcony is great for relaxing to the sight of the sunrise and sunset. The breakfast bar accommodates 4 guests, a perfect set-up for the kids! Below, find coffee shops, restaurants and shopping all just steps away. -3 bedrooms with 3 connecting baths, shower/tub combos, King bed in master and a queen size bed in each of the other two bedrooms. The Pacific Blue villas DOES have an elevator! Our kits include: paper towels, toilet paper, shampoo/conditioner, soap, linens, towels, sponges, dish soap, laundry detergent and softener, dishwasher soap when applicable, trash bags, Keurig coffee makers have k-cups, standard coffee makers, extra blankets, sometimes extra pillows, extra sheets-for sleeper sofas, hair dryers, ironing boards, kitchens fully stocked-enough for max occupancy with some extra settings, toasters, some waffle makers, blenders, tool kits, first aid kits, fire extinguishers, co2/fire detectors, and most have heat available. 6 night Minimum AND a Saturday check-in is REQUIRED during peak season (June - August). Arrival on Friday or Sunday instead may be an option. Check in time is 3 pm most of the year but 4PM Memorial Day through Labor Day, and it's strictly enforced. Ashley was very knowledgeable and friendly. Check in/out info was very accurate and thorough. We enjoyed our experience very much and hope to return soon.